The simplest form of exponential smoothing is called simple smoothing. Simple smoothing is used for short-range forecasting, usually just one month into the future. The model assumes that the data fluctuate around a reasonably stable mean (no trend or consistent pattern of growth). 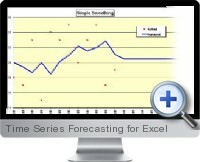 If the data contains a trend, the trend-adjusted smoothing model can be used. Time Series Forecasting exponential smoothing with a trend works much like simple smoothing except that two components must be updated each period: level and trend. The level is a smoothed estimate of the value of the data at the end of each period. The trend is a smoothed estimate of average growth at the end of each period. The Time Series Forecasting approach to forecasting seasonal data is based on the classical decomposition method developed by economists in the nineteenth century. Decomposition means separation of the time series into its component parts. A complete decomposition separates the time series into four components: seasonality, trend, cycle, and randomness. The cycle is a long range pattern related to the growth and decline of industries or the economy as a whole. Two worksheets are available for seasonal adjustment. MULTIMON uses the ratio-to-moving average method to adjust monthly data. ADDITMON uses a similar method called the difference-to-moving average method to adjust monthly data.